Novotel Ambassador Gangnam celebrates the New Year of Tiger and presents a special guest service event for the guests who were born in the year of Tiger. Also, the buffet restaurant ‘Festival’ offers one free dining for a table of 4 or more guests if anyone of the table was born in the year of tiger. Any age is eligible for the offer and a proper ID is required. The winter package ‘Lazing on the Bed’ at Novotel Ambassador Gangnam guarantees your warm and comfortable winter at only 139,000won. The family buffet restaurant ‘Festival’ is another destination for your family dining while featuring all kinds of cuisines from western to Korean including instant open kitchen. The buffet is available for 40,000won for adult and 20,000won for children (lunch). The dinner is priced at 47,000won and 23,500won for adult and children respectively (prices include tax and VAT). 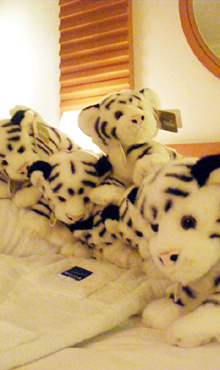 Kick off your new year 2010 with our special event for the guests born in the year of tiger.